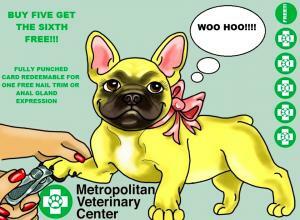 Metropolitan Veterinary Center offers vet coupons, as well as special incentives and savings throughout the year. Occasionally we have different promotions linked to our various social media channels or special savings that are only available to our valued repeat customers. Complete details of all of our current promotions are available below. Please consider the environment before printing this page – many of these coupons can be specifically mentioned or displayed directly from your mobile device to claim the indicated savings. If you and your pet enjoy coming to Metro Vet, let people know. Our goal is to help pets all across the Chicago area live happier and healthier lives, and with the help of responsible owners like yourself we’re trying to spread the word. We’d much rather “pay” you – our loyal customers – than throw money as wasteful advertising. So for every new client that you refer, you will receive a $50.00 credit applied to your account. There are no limitations and no expiration. Every single new owner you refer pays you and your pet! Please contact us for additional details.